The study deals with the multi-level dynamics of urban governance and multiculturalism in EU integration policy from a gender perspective with a focus on: (a) the accommodation of ethnic diversity at the local level of urban governance (b) the local expression of cooperation and organization to accommodate ethnic diversity (c) the local expression of cooperation and organization to increase agency of women within the context of neighbourhood. 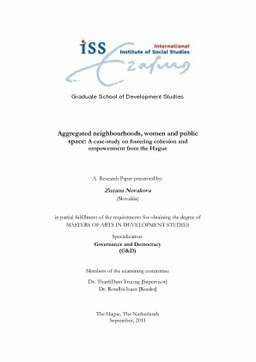 Via case-study of Koffiepot mothercentre - a functional women‘s organization in a context of Laak Noord, an aggregated neighbourhood of city of the Hague, the Netherlands - the paper brings to light the significance of understanding the social construction of urban space. It discusses the role of the ‗agora‘ world of communities, groups and networks of citizens, as actor in the ongoing process of determination of the quality of the social in urban space; with special focus on its potentials in relation to processes of cohesion building in reference to community in spatial terms as well as stirring towards individual and social empowerment. Further unwrapping particular understandings of these over-encompassing terms, it points out how functional organizations like the one studied can in a context of an aggregated neighbourhood contribute to development of the urban space.